Trek in one of Africa's most stunning and least visited wildernesses, the Simien Mountains of northern Ethiopia. Discover this isolated region, admiring the spectacular scenery of rocky plateaus, dramatic peaks and deep gorges, keeping an eye out for gelada baboons. Addis is situated at an elevation of around 2,438m and is just over a century old. It has some elegant modern buildings and is quite spacious with wide streets and green areas. It remains the capital of a predominantly rural area and the Mercato is one of the largest open markets in Africa. This afternoon we will have an orientation tour of the city visiting the Ethnographical Museum and the church of the Holy Trinity, whose large dome and slender pinnacles make it a landmark in the city, followed by a drive up Entoto Hill to take in a panoramic view of Addis Ababa. Today we take a short, but scenic flight to Gondar, located on the high plateau just north of Lake Tana. The town of Gondar was the imperial capital of Ethiopia for 200 years. Gondar's most famous monuments are its exceptionally well preserved 17th century castles. The largest and best is that of King Fasilidas. It is a stone-built construction with round turrets and wooden balconies. This whole complex of buildings is unique in Ethiopia and unlike anything found elsewhere in Africa. On arrival, as well as visiting the castle ruins and King Fasilidas baths, we'll also make a visit to the Debre Berhan Selassie Church famed for its ceiling frescoes of many angel faces. 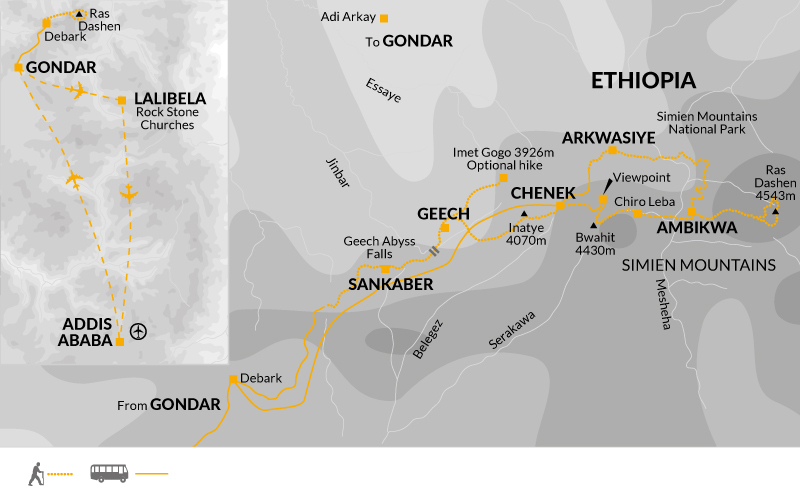 Today, we drive to Debark, the village base for hiking in the Simien Mountains.The range lies north of Gondar and many of the peaks rise above 4,000m with the highest being Mount Ras Dashen at 4,543m. The mountains are criss-crossed with tracks made by the local people travelling from village to village or moving their animals to fresh pastures. The combination of these tracks and the spectacular scenery make for excellent walking. We start our trek with a walk to our first camp Sankaber. Today's five-and-a-half kilometre walk is expected to take around two-and-a-half hours with 1oo metres of ascent and 30 metres of descent. * During the trek we may spend each night in a different place. The circuits walked will vary depending on local conditions and on the group's ability. Details of the standard circuit we might take are given below - the itinerary for days 6 to 12 is given as an example only. We trek today to Geech camp via Sankaber, with the possibility of seeing baboons and red-hot poker plants en route. The gelada baboon is endemic to Ethiopia and has adapted to living on the nearly vertical cliff faces. We may also see the Jinbar river waterfalls today that plummet into Geech Abyss. The Abyss is a vast canyon cut into the main wall of the escarpment. Today's 12 kilometre walk is expected to take around six hours with 680 metres of ascent and 330 metres of descent. A flexible day with a morning optional acclimatisation hike to the viewpoint of Imet Gogo (3,926m). From the viewpoint there are spectacular views of the lowlands and across the Simien range with rock spires and mesas prominent . Keep a close look out for the elusive simien fox. It's misnamed as it is not really a fox but a member of the dog family restricted to Ethiopia. Today's optional 10 kilometre circular walk is expected to take around four hours. We aim to trek to Chenek camp today on a good trail via Inatye (4,070m) and along the escarpment. This exciting walk traverses the Jinbar river and provides us with fantastic views. You may like to take the opportunity to freshen-up in the nearby stream south of camp. Today's 13 kilometre walk is expected to take around eight hours with 810 metres of ascent and 770 metres of descent. Today we trek to Ambikwa and plan to stop at a spectacular viewpoint (4,200m) north of Bwahit where, on clear days, we can see across the Mesheha river to Ras Dashen peak. We then descend steeply and pass through the village of Chiro Leba to follow a stream bed until we reach the large Mesheha River. We'll cross the river and follow a path up the east side of the valley to Ambikwa village, (3,200m) where our camp sits in a little meadow next to a small church. Today's 17 kilometre walk is expected to take around 10 to 12 hours with 1,000 metres of ascent and 1,400 metres of descent. Starting before sunrise we follow the main valley up and climb steeply via Mizma village houses to reach a ridge crest and open grassy slopes (3,700m) on our invigorating ascent of Ethiopia's highest mountain. Next we traverse around ridges and climb more steeply to a broad col at 4250m. Keep an eye open for giant lobelia, by far the most spectacular plant of this region with flower stalks up to 8m high. Eventually we enter a huge semicircular basin of rocky peaks and buttresses - Ras Dashen. The last section involves some steep scrambling and climbing to a fine viewpoint at 4,543m. We'll spend the rest of the day hiking back to our camp. Today's 21 kilometre walk is expected to take around10 to 12 hours with 1,300 metres of ascent and descent. Today we recross the Mesheha River as we make our way to Arkwasiye and our campsite there (3,700m). Today trek has a different feel to it as we walk through the fields and meet local farmers cultivating their land. We will have the opportunity to visit the local school and meet the children. 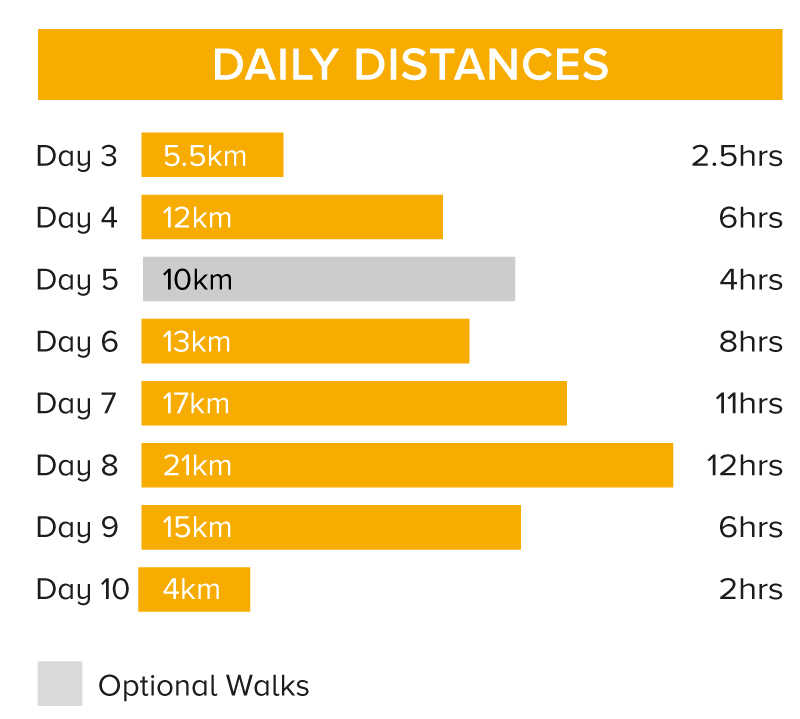 Today's 15 kilometre walk is expected to take around six hours. This morning we walk from Arkwasiye to the roadhead where our vehicle will be waiting. From there drive to Gondar passing by Chenek (3,620 m). We have an early start this morning for our trek . We leave with a packed lunch before our drive to Gondar. The drive takes four to five hours and about a third of the road is unmade. On arrival we check into our hotel for the night. Today's four kilometre walk is expected to take around two hours. This morning we fly to Lalibela for a two-night stay in one of the world's most remarkable historic sites. Although churches carved in rock are found in other parts of the world, those found in Ethiopia are particularly interesting. Generally, they were excavated on all sides of a rectangle, leaving a large block of granite isolated in the centre. This rock was then shaped and formed both inside and out and the carvings show extremely skilful workmanship. Lalibela, the New Jerusalem, is thought to have been constructed some 800 years ago by King Lalibela as his capital city. These days, this UNESCO World Heritage Site is a small village. This afternoon's tour involves a certain amount of scrambling through a labyrinth of tunnels. The churches stand in two main groups on either side of a stream, known locally as 'The River Jordan'. There are 11 rock-cut churches, and we will visit several. The most impressive of the churches is Bet Giorgis, which is carved in the form of a Greek cross and approached through a passage in the rock. Between them, these rock-cut churches are one of the great wonders of the world. Located among the mountains that encircle Lalibela are several more isolated churches. Using mules, we journey for some two hours to Ashatan Maryam Church and are rewarded with stunning views over Lalibela and the peaks and mountains of these remote highlands. Reached by steep shale paths, it will be necessary to dismount in places due to the terrain. Good footwear is a must. Vertigo sufferers or people with a low level of fitness may choose not to partake in the mule trek, your tour leader can advise you. This afternoon we return to Lalibela, allowing more time to explore the rock-cut churches. We fly back to Addis Ababa this morning where the tour ends. -Socks: It is best to wear a pair of liner socks under a pair of fairly thick loop stitch socks. This helps to protect your feet against blisters. Avoid nylon socks, they are abrasive, don't breathe well and can cause blisters. - Jacket: After sunset, temperatures can fall below freezing. A very warm jacket is the most convenient way of keeping warm when the temperature drops. - Waterproofs: Breathable waterproofs made from material such as Goretex not only protects against rain and wind but also stops you from overheating. They breathe and avoid condensation that you will experience from nylon waterproofs. -Long Trousers: For everyday walking, light cotton trousers are the most suitable. Jeans are not recommended as they are often difficult to walk in over longer distances and become cumbersome when wet. -Thick jumper/fleece jacket: A thick jumper or fleece jacket is necessary as nights can be very cold at altitude. Make sure that your waterproof jacket is loose enough to wear over your sweater or fleece. -Thermal underwear: Comfortable around camp and much more practical (and warmer) to sleep in than pyjamas. - Shorts: Can be very comfortable to walk in but you must carry long trousers with you in case you get either sunburned or cold. Follow your tour leaders advice on local sensitivities to wearing shorts during the trek. - Gloves: Especially useful in the morning and in the evening at higher altitudes. Also bring a scarf to cover your face from the dust during the day and a warm hat/balaclava. We recommend you bring waterproof walking boots with ankle support and good tred- leather or fabric are both fine. Trekking shoes will not be suitable for the walks as they do not give ankle support. Make sure that your boots are worn-in and comfortable before the start of the trip. We suggest that on international flights you either carry your walking boots in your hand luggage or wear them - should your luggage be lost or delayed, your own boots are the one thing that will be irreplaceable. A kitbag/barrel bag carried by mules on trek, a stuff-sack to store surplus belongings while on trek and a daysac. Pack mules are used to carry equipment, food and most personal gear. Pack heavy/dense items into your trek kitbag. Before leaving Gondar there is plenty of time to re-sort luggage into what you need on trek and what can be left in Gondar. Think about what you are taking on trek (remember your sleeping bag) and then think how big your kit bag needs to be. A nylon or canvas bag with a zip along the top is suitable, it must be strong and a sof bag is preferable - Framed rucksacks are unsuitable. The weight limit for the bag and its contents is 15kg but you will probably find that you do not need this much. Please note there are occasional opportunities to hand wash clothing whilst on the trek. During the course of a trekking day, you do not have access to the luggage that is being carried for you by the porters. In any mountain region the weather can change rapidly and you must be equipped for this eventuality. Your daysac should, therefore, be large enough to carry the following: waterproofs, sweater, long trousers (if walking in shorts), warm hat and gloves, sun hat, sun cream, water bottle (at least 2litre), tissues and your packed lunch. Most people normally find that this adds up to about 2 to 3kg. Camera equipment can be heavy so think carefully when deciding what to take. Other optional items in a daysac might be binoculars, a diary or a book to read at lunch time. It is usually more comfortable to carry a slightly larger pack that is not full than to carry a small pack that is overfull or with 'bits' tied on the outside. Something between 20 and 30 litres capacity is probably the most suitable. A shoulder bag is not a practical alternative. If you pack your gear in dry bags or plastic bags inside your kit bag they will stay dry in case of rain. It will also be easier for you to sort through. Remember, the less you have to unpack in the evening, the less you have to repack each morning! A bin liner to pack inside your daysac is also a good idea. -Sleeping Mat - Regular sleeping mats will be provided but if you would prefer an inflatable thermarest style you will need to bring your own. -Reusable Water Bottle - Water along the trail must never be considered as drinkable. Take at least a 1 litre personal water bottle, preferably insulated. Each day you must sterilise water with purification tablets/drops with which to fill your own bottle. If you dislike the taste of sterilised water, it is a good idea to add some powdered fruit juice. On this trip you MUST bring your own personal supply of water purification tablets/drops (such as Chlorine Dixoide), enough to purify 30 litres is advised. For environmental reasons, we do not encourage the purchase of bottled mineral water nor the boiling of water due to fuel and power shortages. -Sunglassesnow Goggles - A good pair of sunglasses are essential for protection against UV rays and glare at high altitudes. -Sun Hat, High Factor Sun Cream/Block & Lip Salve - Choose a high factor suncream (Factor 15 or more) to protect your skin against the sun at high altitudes. A combination sunblock/ lipsalve is ideal for facial protection. -Energy snacks, including chocolate and sweets, are also recommended whilst on trek. -Torch/Batteries/Bulb - A small torch is essential for finding things at night. Often a head torch is useful for the early ascent to the summit. Remember to bring some spare batteries. -Personal toiletries - Essentials are toothbrush/paste, soap (preferably biodegradable), small towel. Wet wipes are great for a quick clean up, so bring a pack of those. -Personal First Aid Kit - on each trek a first aid kit is carried but you should have your own blister kit, supply of plasters, aspirin and other essentials. Please do not give medicines to local staff without consulting the tour leader. Equipment Hire and Trek Training Days -Trek Hire UK hire out a wide range of kit including quality sleeping bags, down jackets, therm-a-rest sleeping mats and walking poles http://www.trekhireuk.com. They also run regular trek training and preparation days from their base in the Surrey Hills, ideal for getting an indication of your overall fitness level and also covering advice on kit and altitude. Accordingly, you should allow approx. US$100.00 per person for tipping of local drivers, guides, muleteers and for any miscellaneous tipping of hotel staff. Trekking in the Simien Mountains we spend 7 nights wild camping. Two-man and three-man tents are provided with plenty of room for one or two people and bags. There is also a dining tent and basic long drop toilets. The trek is fully supported by our team of mountain guides, cook and camp assistants who set up the camp (before you arrive), take down the tents, and prepare our meals. A bowl of warm water will be provided to you for washing each morning and when you get to camp after a day's walking. Mules will be used to carry water, tents and all bags except daysacks. In the Simien Mountains trekking is strenuous with 6-8 hrs a day walking on average, at altitudes of 3,000- 4,500m, though there are some longer days (including the ascent of Ras Dashen, 4,543m). There is very little flat walking involved. We cover approx 65 miles, ascend 7460m and descend 6880m. Your leader will ensure that during your stay in the mountains you acclimatise enough before an ascent of Ras Dashen. At altitude you will find yourself moving slower than usual, but this gives an excellent opportunity to admire the spectacular views. Bear in mind that the trek to the summit of Ras Dashen is optional, and can be omitted if so wished. Trek on 8 days for between 2.5 to 12 hours, mostly above 3,000m (day 5 is optional). Maximum altitude is 4,543m. Mules carry all food, luggage and equipment.